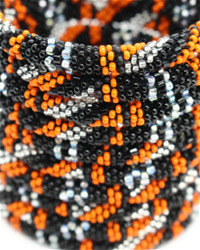 A 100% woman run project, each Lotus Sky bracelet helps provide sustainable careers and scholarships to women in Nepal. As a part of the New Fair Trade Movement, we empower women with “investable wages” and offer customers unparalleled quality and radical transparency. Join the movement- roll on a bracelet and change her world! Gameday Bracelet Collection in Your Team Colors! Each Lotus Sky bracelet is handmade in Kathmandu, Nepal by our all woman team. Combining our intricate beadwork design expertise with a socially responsible training program that has launched careers for over 150 women, we will create a bracelet collection for your team and customers that is stackable, mix and matchable, super fun, and supports a meaningful cause. 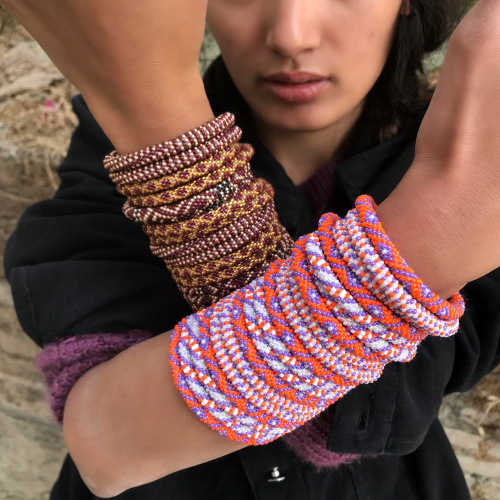 Using small glass seed beads, our artisans and designers will create various bracelet designs in your team colors that will encourage your customers to buy multiple bracelets at a time as they enjoy creating their own stacks as well as buying curated sets for friends and family. Choose the number of individual designs that you would like, all crafted in your team colors, to create an impactful and visually striking display that will have customers coming back to build their collections time and time again. Made for high stacking, Lotus Sky bracelets provide awesome merchandising opportunities, supported all the more by customers' love of socially responsible products, especially within the university market. Join the movement and help us continue to provide sustainable careers to women in Nepal!